A train carrying Republican members of Congress struck a garbage truck in Virginia late Wednesday morning. 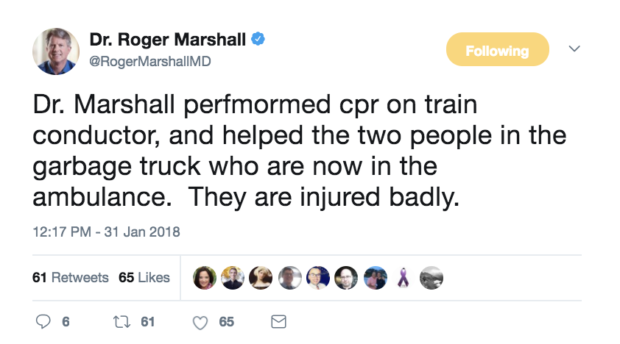 As details roll in about the crash, we have learned who was off the train first: GOP doctors, looking for injured people to help. According to multiple interviews with members on the train, a number of physicians immediately rushed off their cars to tend to the wounded and perform potentially life-saving treatments. I’m hearing there are some injuries on the train. First thing we were hearing is — fortunately amongst the delegation you have a lot of doctors. So there was a call out for doctors, highest priority, right outside of the train. It was pretty amazing. The first responders were really the member doctors who were demanding to get off the train. Security was concerned because it looked like there might be gas leakage. They were concerned there could be an explosion. There wasn’t, as it turned out. But fortunately, a lot of doctors that are members in both chambers. Michael Burgess from Texas, Roger Marshall from Kansas, Senator Bill Cassidy from Louisiana. They actually were the first people on the scene as far as I could tell… they managed to get out on their own. They were the first ones rendering assistance. Then you pretty quickly had emergency first responders, paramedics, a lot of fire vehicles and balances here now. But yeah, they were administering CPR to the folks that had been hurt in the crash.